Acronym Institute for Disarmament Diplomacy - Conducts research and publishes information on negotiations and verification of arms control, disarmament and related treaties and agreements. Also publishes Disarmament Documentation, a compilation by Dr. Sean Howard of recent official documents and statements on arms control, non-proliferation and disarmament. Americans for Gun Safety Foundation - Seeks to educate Americans on existing gun laws and new policy options for reducing access to guns by criminals and children and to promote responsible gun ownership. Arms Control Agreements - A comprehensive guide to arms control agreements, treaties and regimes. Maintained by the Federation of American Scientists (FAS). Arms Control and Disarmament Agency (ACDA) Archives - Archives of this U.S. agency (now fully integrated into the U.S. Department of State) are maintained at this site provided by the University of Illinois at Chicago. Arms Control Wonk - Leading blogs on arms control, disarmament and non-proliferation. Arms Fixers, The: Controlling the Brokers and Shipping Agents - Arms brokers and transport agents locate arms as cheaply as possible. Then some send them by circuitous international routes to the most conflict-torn countries and regions of human rights abuse in the world. This study looks at what they do, and makes proposals for stopping it. Arms Sales Monitoring Project - Works for restraint in the global production and trade of weapons. Maintained by the Federation of American Scientists (FAS). 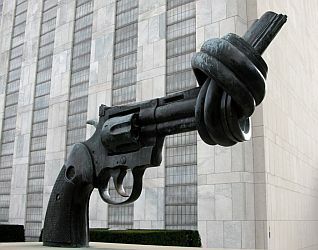 Arms Trade: A Major Cause of Suffering - Links and information about issues regarding the arms trade around the world. Brady Campaign to Prevent Gun Violence - U.S. national grassroots organization leading the fight to prevent gun violence through handgun control efforts. British American Security Information Council (BASIC) - BASIC is an independent research organization that analyzes government policies and promotes public awareness of defense, disarmament, military strategy and nuclear policies in order to foster informed debate. Bureau of Arms Control, Verification and Compliance (AVC) - Part of the U.S. State Department. Provides oversight of both policy and resources of all matters relating to verification of compliance with international arms control, nonproliferation, and disarmament agreements and commitments. Bureau of International Security and Nonproliferation (ISN) - Arms control, nonproliferation, trafficking. Part of the U.S. State Department. Campaign Against Arms Trade (CATT) - A broad coalition of groups and individuals in the UK working to end the international arms trade. This trade has a negative effect on human rights and security as well as on global, regional and local economic development. Campaign Against Depleted Uranium (CADU) - Seeks a global ban on the manufacture, testing, and use of depleted uranium weapons. Carnegie Proliferation News Archive - A free, twice-weekly electronic summary of news and analysis on efforts to prevent the spread and use of nuclear weapons published by the Carnegie Endowment for International Peace (CEIP). Center for Arms Control and Non-Proliferation - Seeks the reduction and eventual elimination of nuclear weapons as a significant tool of U.S. national security policy. The Center covers numerous peace and security issues affected by proliferation of weapons of mass destruction including U.S. nonproliferation programs, national missile defense, failed and post-conflict states and irresponsible defense spending. Center for Arms Control, Energy and Environmental Studies - Ongoing events, discussions and publications related with nuclear arms reductions, arms trade and technical cooperation. Citizens' Nuclear Information Center - An anti-nuclear public interest organization dedicated to securing a safe, nuclear-free world. Cluster Project, The - An ongoing web gallery and blog that uses multimedia artworks to explore weapons, war, civilian casualties and pop culture. Coalition to Oppose the Arms Trade (COAT) - Exposes and opposes Canada's role in the international arms trade, particularly where there is trade to governments which are engaged in war or which violate human rights. Coalition to Stop Gun Violence (CSGV) - Emerged from the civil rights movement in the early 1970s and pushes a progressive agenda to reduce firearm death and injury. Combating Proliferation of Weapons of Mass Destruction - Report of the Commission to Assess Organization of the Federal Government to Combat the Proliferation of Weapons of Mass Destruction. Presented to the U.S. Senate on July 14, 199. Defense Threat Reduction Agency & USSTRATCOM Center for Combating WMD - The U.S. Department of Defense's official Combat Support Agency for countering weapons of mass destruction. Depleted Uranium Education Project - It matters little to the Pentagon in its race for unrestrained military dominance in every type of warfare that this new weapon not only kills those it targets, it poisons soldiers who handle it, civilians for hundreds of miles surrounding the battlefields who breathe the air and drink the water, and unborn generations. This site provides information and resources for fighting against the use of depleted uranium. Drone Wars UK - Information and comment on use of UK drones. Everytown - A movement of Americans working together to end gun violence and build safer communities. Fellowship of Reconciliation Disarmament Program (FOR) - FOR's disarmament program seeks to create a world free of weapons, and to abolish all institutions that conduct, support, and profit from warmaking. For Mother Earth - International campaign for disarmament, ecology and human rights. GunPolicy - International bulletin of firearm injury prevention since 1997, Gun Policy News provides daily global and regional bulletins of small arms policy, armed violence prevention and gun control news published in mass media. With its partners and contributors, GunPolicy promotes the public health model of firearm injury prevention, as adopted by the United Nations Programme of Action on illicit small arms. Institute for Science and International Security (ISIS) - Dedicated to informing the public about science and policy issues affecting international security. Its efforts focus on stopping the spread of nuclear weapons, bringing about greater transparency of nuclear activities worldwide, and achieving deep reductions in nuclear arsenals. Also see Roadmap to Responsible Export Controls. International Action Network on Small Arms (IANSA) - Facilitates NGO action aimed at enhancing human security by preventing the proliferation and misuse of small arms. International Committee for Robot Arms Control (ICRAC) - Focuses on the pressing dangers that military robots pose to peace and international security and to civilians in war. Know Drones - Provides materials to support citizen action to achieve an international ban on weaponized drones and surveillance drones. Landmine and Cluster Munition Monitor - An initiative providing research for the International Campaign to Ban Landmines (ICBL) and the Cluster Munition Coalition (CMC). It is the de facto monitoring regime for the Mine Ban Treaty and the Convention on Cluster Munitions. It produces several research products including the annual Landmine Monitor and Cluster Munition Monitor reports, online country profile reports, as well as factsheets and maps. Also see U.S. Mine Ban Policy page. Law Center to Prevent Gun Violence - Information on gun laws in the U.S.
Laws of War (The Avalon Project) - Miscellaneous treaties, conventions and agreements. Library of Congress' THOMAS: Treaties - This database covers treaty information from the 94th Congress to the present. Treaty information is also available from the 90th to the 94th. Information is available for just a few treaties from the 81st through the 89th Congresses. Limitation of Anti-Ballistic Missile Systems (ABM Treaty) - Treaty between the U.S. and the USSR on the limitation of anti-ballistic missile systems (ABM Treaty). Signed at Moscow: May 26, 1972. Ratification advised by U.S. Senate: August 3, 1972. Ratified by U.S. President: September 30, 1972. Proclaimed by U.S. President: October 3, 1972. Instruments of ratification exchanged: October 3, 1972. Entered into force: October 3, 1972. Los Alamos Study Group - A nuclear disarmament organization based in Albuquerque, New Mexico. Mine Ban Treaty - Convention on the prohibition of the use, stockpiling, production and transfer of anti-personnel mines and on their destruction, 18 September 1997. Missile Technology Control Regime (MTCR) - MTCR backgrounder provided by the Federation of American Scientists (FAS). Missile Technology Control Regime (MTCR) at a Glance - MTCR backgrounder provided by the Arms Control Association. Montreal Protocol - An international agreement designed to protect the stratospheric ozone layer. The treaty was originally signed in 1987 and substantially amended in 1990 and 1992. The Montreal Protocol stipulates that the production and consumption of compounds that deplete ozone in the stratosphere - chlorofluorocarbons (CFCs), halons, carbon tetrachloride, and methyl chloroform - are to be phased out by 2000 (2005 for methyl chloroform). Montreal Protocol on Substances that deplete the Ozone Layer - The Protocol is constructively flexible: it can be tightened or "adjusted" as the scientific evidence strengthens, without having to be completely renegotiated. Indeed, it sets the "elimination" of ozone-depleting substances as its "final objective." The Protocol came into force, on time, on January 1st, 1989, when 29 countries and the EEC (representing approximately 82 percent of world consumption) had ratified it. National Security News Service - A nonprofit staffed by award-winning investigative reporters whose mission is to investigate previously overlooked news stories about significant issues-chief among them the environment and national security. Nonproliferation - Directorate at the Lawrence Livermore National Laboratory. Provides technology, analysis, and expertise to aid the U.S. government in preventing the spread or use of weapons of mass destruction. Nonproliferation Policy Education Center (NPEC) - Educates policymakers, journalists, and university professors about proliferation threats and possible new policies and measures to meet them. Norwegian Initiative on Small Arms Transfers - A wealth of information on small arms issues. Nuclear Proliferation Prevention Project (NPPP) - Based at the LBJ School of Public Affairs, University of Texas at Austin, the NPPP leads research projects, hosts speakers and conferences, trains students, develops policy proposals, briefs government officials, and disseminates findings via scholarly and popular publications and the internet. Reaching Critical Will - A project of The Women's International League for Peace and Freedom which seeks nuclear disarmament. Small Arms Survey (SAS) - The Swiss government, in conjunction with other interested governments, established the Small Arms Survey project in 1999. SAS is an annual review of global small arms issues which address topics such as products and producers, stockpiles, arms brokers, legal and illicit arms transfers, the effects of small arms, and national, bilateral, and multilateral measures to deal with the problems associated with small arms. Stockholm International Peace Research Institute (SIPRI) - Information on weapon developments, arms transfers and production, military expenditure, as well as on arms limitations, reductions and disarmament. Also see SIPRI Yearbook, a compendium of data and analysis in the areas of security and conflicts, military spending and armaments, and non-proliferation, arms control and disarmament. Treaty on the Non-proliferation of Nuclear Weapons (NPT) - The NPT is a landmark international treaty whose objective is to prevent the spread of nuclear weapons and weapons technology, to promote cooperation in the peaceful uses of nuclear energy and to further the goal of achieving nuclear disarmament and general and complete disarmament. The Treaty represents the only binding commitment in a multilateral treaty to the goal of disarmament by the nuclear-weapon States. Opened for signature in 1968, the Treaty entered into force in 1970. U.S. State Department Bureau of International Security and Nonproliferation (ISN) - Leads U.S. efforts to prevent the spread of weapons of mass destruction (nuclear, chemical, and biological weapons) and their missile delivery systems; to secure nuclear materials in the states of the former Soviet Union; and to promote nuclear safety and the protection of nuclear materials worldwide. United Nations Monitoring, Verification and Inspection Commission (UNMOVIC) - Created through the adoption of Security Council resolution 1284 of 17 December 1999. UNMOVIC replaces the former UN Special Commission (UNSCOM) and continues the latter's mandate to disarm Iraq of its weapons of mass destruction (chemical, biological weapons and missiles with a range of more than 150 km), and to operate a system of ongoing monitoring and verification to check Iraq's compliance with its obligations not to reacquire the same weapons prohibited to it by the Security Council. United Nations Office for Disarmament Affiars (UNODA) - Promotes nuclear disarmament and non-proliferation, strengthening of the disarmament regimes in respect to chemical and biological weapons, and disarmament efforts in the area of conventional weapons, especially landmines and small arms, which are the weapons of choice in contemporary conflicts. This webpage last updated on Thursday, November 9, 2017 2:33 PM.